As a rough approximation, the Yes movement two years ago was a coalition between the blue and yellow tribes, and the No side was home to both the green and red ones. However, during the Brexit referendum, the Remain side brought together the blues and the greens, and the Leave side consisted of the yellows and the reds. I’ve been thinking about the four tribes of Scotland a bit more. 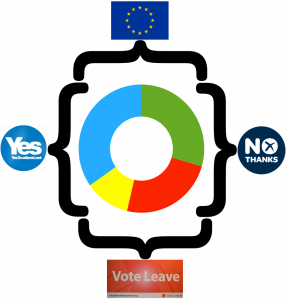 The blue tribe consists of the 33% of voters who want Scotland to be an independent country inside the EU [mnemonic: blue as the Saltire and the EU flag]. The yellow tribe is made up of the 11% who want Scotland to be a completely independent country outside both the UK and the EU [mnemonic: yellow as the background on the lion rampant flag, which this group in my experience is very fond of]. The green tribe is home to the pro-EU unionists who were perfectly happy inside both unions (28% of voters) [mnemonic: green for hope, because they will hopefully vote Yes next time]. The red tribe is made up of the 23% of voters who are pro-UK Brexiters [mnemonic: red as the cross on the English flag]. The first point that I don’t think I stressed enough in my first post on this topic is that it’s important to bear in mind that the four tribes aren’t homogenous groups separate from each other. Many voters for instance inhabit the blue-green borderland – they’re primarily internationalists and aren’t actually that concerned about whether they’re citizens of Scotland or the UK. Other voters are found in the blue-yellow area and are primarily pro-Scotland and less concerned with Scotland’s membership of the EU. The interested reader can as an exercise describe the green-red and yellow-red voters. In Indyref2 the goal for the Yes side is to turn the blue-green greens into blue-green blues without losing the yellow tribe (in particular the yellow-red yellows). And similarly I expect the No side will focus on winning over the yellows without losing too many of the greens. And this leads me to my second point: I don’t think the opposing tribes have anything in common. The blue and red tribes are complete opposites, as are the green and yellow ones. It’s interesting that when Better Together (which were of course dominated by green-tribe politicians) talked about the Yes side, they always seemed to describe the yellow tribe and not have any understanding of the blue tribe, and I think the Yes side (which was almost entirely a blue-tribe effort) made a similar error of assuming all No voters were deep down from the red tribe, and we didn’t really understand how you could be a progressive internationalist and still vote No. If my analysis is correct, the potential problem for Indyref2 is that you can’t create a successful coalition of yellow-blue-green: As soon as you start appealing to the green tribe, the yellows will walk out in disgust, and vice versa. It’s already very clear that the yellow tribe are deeply unhappy about Indyref2 being run on the basis of continued EU membership. On the other hand, if we focus too much on keeping the yellow tribe on board, we’ll be unable to appeal to the green tribe. The million-bawbee question is how many members of the green tribe we can realistically win over in Indyref2. If we stop appealing to the yellow tribe, we need to win over a significant number of green-tribe voters to compensate. We badly need an opinion poll to segment the green tribe into blue-green and red-green (and perhaps even finer shades than this). When push comes to shove, how many of them will join the blue tribe rather than the red one? I hope this is something the SNP are doing behind the scenes. I’d say any polling of the green tribe should also include the yellows. Because if both groups break 50-50, we’re still ‘only’ at 53% yes. If they both break 40-60 in favour of the UK, we’re screwed. And of course there’ll be blue and reds who would reject whichever of the various Brexit deals we end up getting. It’s probably better to simply poll enmasse, presenting the various Brexit scenarios and asking how each tribe would vote in an Indyref under those circumstances. We know now there are broadly four plausible scenarios. Q1. Parliament has overturned the referendum result and Britain will remain a full member of the EU. Would you vote Y/N to Scottish Independence ? Q2. The government has secured a deal which sees the UK achieve Switzerland/Norway status, retaining free market access and free movement. Y/N? Q3. [Details yet to emerge of a tailored deal]. Y/N? Q4. No deal has been reached and the UK will fall back onto WTO rules. Y/N? Bonus Q: The dream Brexit scenario has been achieved. There will be single market access, financial passporting and no freedom of movement into the UK(Britons can still access Europe freely). The UK will not need to pay increased fees or elect MEPs. Y/N? I suspect the results would show us that making Europe the main priority of an indyref2 is dangerous. A priority, yes, but off the top of my head there are five better priorities to campaign upon – Trident, perpetual Tory government & austerity, Hinkley & the renewables slash, Scottish sovereignty(take back control! from westminister) and sorting out our broadcasting sector. My nightmare scenario is a premature IndyRef2 which the UK government then uses as an excuse to abort Brexit or for making significant concessions(e.g. keeping free movement). Tories shrug, say “Blame the Scots,” and carry on bleeding us with a specific mandate for doing so from angered voters south of the border. If I had voted I would have been in the 11%. That only means that independence comes first and foremost. EU membership is not a prerequisite and therefore it should not be assumed that the 11% are against the EU as this post suggests.